Welcome to the Isaac Wing House. The House is located on First Street with great views of Lake Superior. During your stay, watch the gorgeous sunrises from your room or the decks, enjoy the beautiful gardens, or the boats coming and going from the harbor. This House has five suites, each decorated with a different theme. 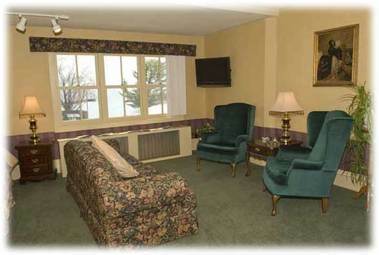 All suites have wireless internet, sitting areas with cable tv, air conditioning, and coffee/tea/hot chocolate options. Four of the five rooms have in room refrigerators and microwaves. The House is non smoking, but outside options for smoking guests are available. We are dog friendly with an additional charge for their stay. Off street parking is provided to all guests. There are two common sitting areas on the 2nd floor of the House. The back sitting room holds a trunk full of board games for family fun. The decks are open to all guests as well as the gardens, which are some of the most greatly appreciated and photographed in Bayfield.. Newly restructured, the gardens offer a calm and private setting to read a book, watch the lake or play a yard game. The House offers several yard games for your enjoyment. Whatever you need is within walking distance, be it the marina to board a boat, restaurants, ferry line, hiking/walking the local trails, or browsing the shops. The Isaac Wing House is managed by the Bayfield Inn . For rates and availability, call (800) 382-0995.